The history of the kilt pin originates with Queen Victoria, who, upon observing a kilted soldier standing at attention with the wind whipping his kilt up around his ears, came to his rescue by pinning the aprons of his kilt together with a pin she was wearing. Thereafter, it was decreed that all Scottish regiments would wear some device to hold their kilts down. Regiments such as the Black Watch, however, opted for rosettes of ribbon. Many people object to the kilt pin because of its feminine origins and some men refuse to wear a kilt pin at all; while some don't feel dressed without one. This is certainly optional and my sentiments tend to fall somewhere between the two extremes. If you do decide to wear a kilt pin, the proper place to wear it is three inches from the bottom of the kilt and three inches inward from the right side of the apron. The kilt pin should only go through the top apron and not be pinned to the bottom apron. Any variation in this general area is considered ok, and if you have a double thickness on the right side of the apron, you might affix it to that area. The biggest objection I have to the kilt pin is its predilection to getting snagged and the possibility of tearing the kilt. 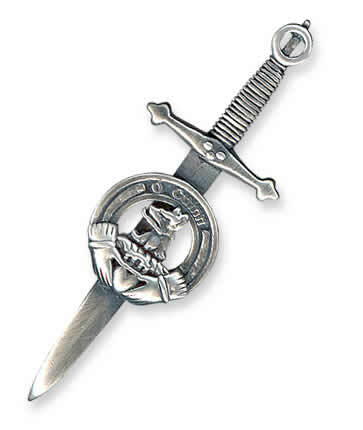 Again, as with the sgian dhub and the sporran, the kilt pin should be appropriate for the level of dress and the occasion. Silver or gold kilt pins with jewels are properly only worn with evening wear. A plain silver or brass kilt pin is appropriate for daywear. Some people have problems with the clasp of their kilt pin coming loose and their pin falling out and being lost. To prevent this, one idea it to take the eraser off of a pencil and run it through the back of your pin as you pin it on your kilt. If the clasp should come loose, the eraser will keep your pin from falling off.